As it turns out, Disneyland may not be the happiest place on earth, after all. More than a few studies indicate that the title may go to Costa Rica. A small Central American country with an outsized enjoyment and appreciation of life. Part of your Costa Rica travel should definitely involve mingling with the locals that color this country so brightly. Thousands of tourists and expatriates seem to agree, with travel to the tropical nation increasing in recent years. So what makes the Costa Rican people so unique? The country is a melting pot, for one thing. A large part of the population is of Spanish origin. People of Costa Rica also have German, English, Italian, and a handful of other European nationalities among their ancestors. There is also a small Afro-Caribbean population of about two percent by the Caribbean Coast. 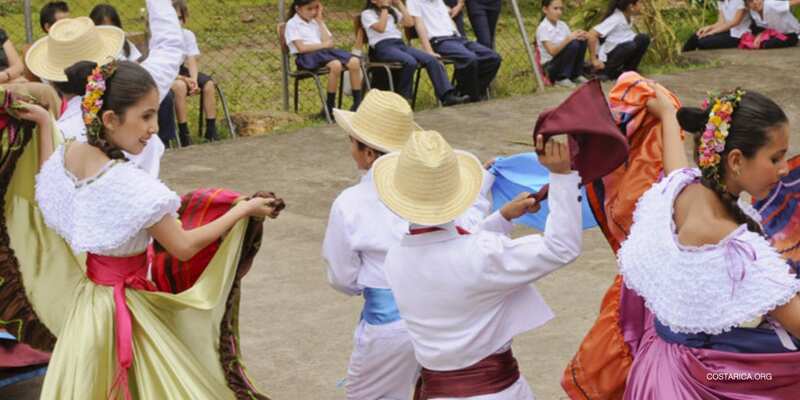 Indigenous cultures are not as predominant in Costa Rica as they are in other places in Central America. But they still populate some areas in the country, like the Talamanca mountain range, and are gaining rights as well as attention from tourists. But the culture that left the biggest mark is no doubt the Spanish one. Relative stability and prosperity have made Costa Rica an attractive destination for people from neighboring Central American countries, as well as retirees from the United States, Canada and Europe. The recent conflicts in Nicaragua have also lured some immigrants and asylum seekers to Costa Rica. Although Costa Rica has always been the rich neighbor and has appealed to the Nicaraguan people for a long time. Costa Rica is full of history which still defines the locals today. The Ticos have a strong culture that has been shaped by many different influences over the centuries. The Art of Costa Rica is rich and beautiful and comes in all kinds of colors and shapes. Read more about its wonderful history and what makes Costa Rican art so unique. Color defines the Costa Rican in more ways than one. And one of those ways is in the traditional clothing still worn at national festivals and events. The official language in Costa Rica is Spanish. Costa Rican Spanish is easy to understand and most Costa Ricans speak very clearly and slowly and don’t have a strong accent. Costa Ricans follow the sport of football religiously. Learn more about the National Team! Football is one of the favorite pass-times for a lot of Ticos as a game to play as well as to watch. The bars are crowded on every game night with Ticos as well as Ticas shouting at the TV screens. There are a number of different religions in Costa Rica but Catholicism is the predominant one. Catholicism is the official religion of Costa Rica and is a required subject in schools. Costa Rica is the only state on the American continent which has established Catholicism as its state religion. Thus, religion is a big part of Costa Rican culture. The importance of religion is evidenced in the language, holidays and traditions. In fact, the term “Christian,” or Cristiano, is used synonymously to mean “human being.” Over 60% of the people in Costa Rica identify themselves as Catholic. Religion defines the Costa Rican way of life. You can find churches alive with song and prayer and biblical verses painted on the buses. The traditions of the Costa Rican people are just as much a part of daily life as anything else. With Catholicism being the main religion, a lot of the traditions are defined by the Catholic faith. The pilgrimage to Cartago during Holy Week and Easter is a tradition that has been going strong for many years. How do you explain happiness and longevity of Costa Ricans? How come they have mastered the art of joy while the people in the US are buying self-help books? On the one hand, life is slower in Costa Rica. Perhaps due to the tropical climate, but there is a pleasantly languid quality of life there; people just aren’t in much of a hurry in Costa Rica. Life is to be enjoyed and savored, not rushed through at a more expensive rate. Imagine a place with incredible natural beauty but none of the hustle and bustle of many US cities. Your environment can affect your mood more than you think. The life expectancy of the Costa Rican is one of the highest on the planet. Places like the Nicoya Peninsula have received the honor of being called one of the Blue Zones of the world. Nicoya as well as the whole culture of Costa Rica has been defined by this desire to live a long and happy life. This is also why Pura Vida, meaning pure life, has defined Costa Rica’s cultural identity. The clean air produced by all the national parks and beaches no doubt only help in this! Costa Rica’s sense for a pure life is also reflected in its food culture. The staple of the Costa Rican diet is rice and beans. This is presented in the form of Gallo Pinto for breakfast or Casado for lunch. But even the national dish has some cultural differences depending on the area. By the Caribbean coast, they add coconut to the rice creating a sweet and intoxicating flavor. By the Pacific coast, however, the coconut is replaced by cilantro and Salsa Lizano. You can sample some of these amazing flavors in the province of Guanacaste and Central Valley and Puerto Viejo de Talamanca by the Caribbean Coast. Guanacaste, especially its capital Liberia, has a pretty loud presence of fast food culture for such a small town. But if you wander away from the city center just a little, you can find some amazing sodas that serve the traditional Costa Rican food. Compared to some of its neighbors, Costa Rica is a haven of stability and peace. The country abolished its army in 1948, and to this day it has no army. In many parts of the world, imagining ones’ country without a military is almost impossible. But the money that Costa Rica could have spent on maintaining a military force has instead been channeled into education, health care, and preserving the country’s environment. The University of Costa Rica, for example, offers almost free education to its residents and also makes big strides in the research and improvement of its social and environmental systems. These are the very things that so many tourists and expats find attractive about the country today. The decision to demilitarize the country and instead invest in democratic institutions and the health and well-being of the people has undoubtedly contributed to the happiness of Costa Rica. Costa Rica may not have the world’s largest GDP, but consider what it does have. For example, abundant natural beauty, a slower, calmer approach to life, efforts to promote and protect that environment. Also, stable, democratic institutions aimed at the well-being of its people. No wonder the Costa Rican people consistently rank among the happiest people on earth. Long before many countries had an eco-anything, Costa Rica was already making efforts to protect its environment. While many countries place little priority on environmental protections, Costa Rica is one of the world’s leaders in environmentalism. Many other nations seem to be preoccupied with cutting down forests for new real estate developments. Costa Rica does things the other way around—the country has a massive tree-planting initiative focused on creating new forests, rather than destroying it. Not to mention the amount of rainforests and diversity in this small country. The best example of highly concentrated biodiversity in one place, has to be Corcovado National Park with the world’s largest concentration of flora and fauna. This part of the country is still pretty remote and located in the South Pacific side as part of Osa Peninsula. In fact, Costa Ricans have learned to live in harmony with its natural surroundings. Think about La Fortuna, the small but bustling town at the foot of Arenal, one of the active volcanoes in Costa Rica! Costa Rica does still produce farm lands, of course. The most popular ones are used as coffee and banana plantations. It is wonderful to have access to such beautiful landscapes. In 2016 Costa Rica used 98% green energy. This came from hydro, wind, solar and geothermal power sources. Costa Rican People have good reason to be happy from their peaceful government to the gorgeous lands it is the country of Pura Vida. Why not come and join us.